There are literally hundreds of opinions on the chemicals we use in water in the UK, but which ones should we believe? There are a few of you out there that wouldn't give it a second thought but, in actual fact, our water isn't just water at all, it harbours almost everything it comes into contact with - just like how homoeopathy works. Water will pick stuff up along its pipe travels, and will carry heavy metals, minerals and bacteria - but that's a natural function of water, what we want to look at is some of the additives to 'combat' the picked up stuff. There are many chemicals added to water to clean it, and there are also chemicals added to 'medicate' us. "A health trust has become the first to force through a move to add fluoride to tap water to fight tooth decay in children. The decision was made using new laws to introduce fluoridation, although three in four members of the public and a county council opposed it. Adding fluoride to water has been described by critics as 'mass medication' of the population because, unlike chlorine, it is not added to make supplies safe. Around 200,000 people in Southampton will be affected in an area where four in ten children have a filling by school age. Dentists said it would reduce the number of decayed teeth. Just 10 per cent of England's water is fluoridated, covering 5.5million people, mainly in the north-east and west Midlands. The last fluoridation scheme was introduced in 1985, but the Health Secretary last year called for further schemes after consultation, saying most people were in favour." So from that we can tell there has been at the very least some debate - It also tells us that fluoride was introduced to 'medicate' us with the hopes of reducing decay in teeth. It looks as though, there have been doubts about the effectiveness and the morality of dosing the nation. There are millions of reports from scientists, herbalists and bloggers alike, of finding information (whether first hand, or second) that suggest Fluoridation will only enhance the creation of cavities in teeth. “Chlorine has been hailed as the savior against cholera and various other water-borne diseases, and rightfully so,” says Steve Harrison, president of water filter maker Environmental Systems Distributing. “Its disinfectant qualities…have allowed communities and whole cities to grow and prosper by providing disease-free tap water to homes and industry." "Harrison says that ‘all this disinfecting’ has not come without a price: Chlorine introduced into the water supply reacts with other naturally-occurring elements to form toxins called trihalomethanes (THMs), which eventually make their way into our bodies. THMs have been linked to a wide range of human health maladies ranging from asthma and eczema to bladder cancer and heart disease. In addition, Dr. Peter Montague of the Environmental Research Foundation cites several studies linking moderate to heavy consumption of chlorinated tap water by pregnant women with higher miscarriage and birth defect rates." Weirdly, wherever my research into the subject takes me, there seems to be less of an upside to these chemicals, and a HUGE downside instead. Filtered water is one of the best and cheapest options to keep drinking water purer. Many items under this option are around £30-£70 off the bat, and about £10-£40 to replace the cartridge(s) every 6-12 months. They can easily be installed at home yourself too, which is a bonus, and are small enough to fit in very small spaces. Filtered water is good. 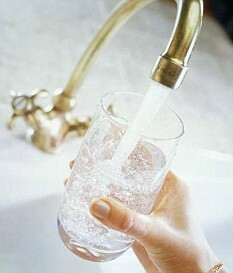 Water that's been through a reverse osmosis treatment is a million times better - this basically means water is filtered up to 5 times, through very fine filter membranes, on the smallest scale possible, taking out all the additives, smell and even fluoride, which is especially hard to remove from water. The reverse osmosis units are particularly hard to find for home use at an affordable price, but we've found a great little one here, that will fit under a sink! We never usually consider the effects the scale has on our bodies, it's usually the damage it does to pipework, the taps and the shower head! Having a bath in water that has magnesium and calcium particles floating around in it, can damage skin and hair, making them dry, and sink into our bloodstream whilst we clean ourselves. Water softeners, that use salt and resin, are a great for making the water 'soft' as apposed to hard. You'll also find your cleaning products and shampoo will go a lot further, in essence making this option somewhat pay for itself eventually! Ultraviolet water purification lamps produce UV-C or "germicidal UV," radiation of much greater intensity than sunlight. UV treatment is an great choice to get rid of contamination for most homes. For this option, we must be aware, that ultraviolet purification systems are usually combined with various forms of filtration, as UV light is only capable of killing microorganisms such as bacteria, viruses and molds etc. All these options are great for helping to keep water a little more in control at home, and there are some brilliant technologies up and coming; stay tuned for a sequel article! Labels: 5 Top Ways to Purify Water, chlorination, chlorine, Filter, fluoridation, fluoride, how can I, Pure, purify, purifying water at home, Reverse Osmosis, UV, Water, Water Softener, what to do, which filter?